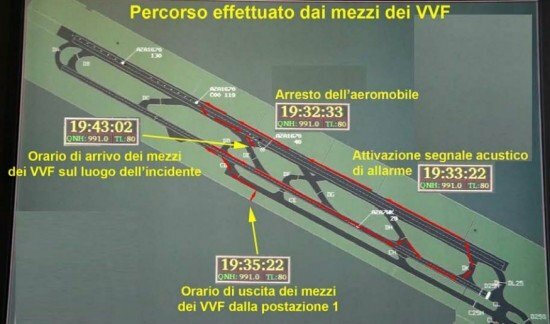 According to a report by the Italian aircraft accident investigation agency ANSV it took emergency services ten minutes to reach an ATR-72 passenger plane that had suffered a runway excursion at Roma-Fiumicino Airport, Italy. Two interim safety recommendations were made. On February 2, 2013, an ATR-72 passenger plane, registered YR-ATS, sustained substantial damage in a landing accident at Roma-Fiumicino Airport (FCO), Italy. Of the fifty occupants, four were injured. Alitalia flight AZ1670 had departed Pisa-Galileo Galilei Airport (PSA) on a domestic flight to Roma-Fiumicino Airport (FCO). This flight was operated by Carpatair on behalf of Alitalia. The airplane flew the approach in strong cross wind conditions with wind shear reported at runway 16L some fifteen minutes before the landing. Shortly before touchdown the airplane suddenly lost altitude and impacted the runway with the nose landing gear. It bounced three times, causing the nose and main gear to collapse. The airplane slid off the left side of the runway and came to rest in the grass near taxiway DE, at a distance of about 1780 meters from the runway threshold. It came to rest at 20:32:33 h, at 400 m from fire station nr.1. The crash alarm was raised at 20:33:22 when the tower failed to establish radio contact with flight 1670. The tower then established radio contact with the fire services. The fire services arrived at taxiway DD at 20:35:59 and contacted the Tower controller, requesting information about the position of the aircraft. It was dark and they were not able observe the airplane. The Tower controller responded “Shortly after Delta Echo”, which was confirmed by the fire services. Procedures called for the use of a grid map reference to point out the location of an accident. The Tower did not communicate this grid reference, nor did the fire services request such a reference. Meanwhile the emergency services had trouble locating taxiway DE. They drove all the way to the end of the runway and returned, initially passing taxiway DE. At 20:43:02 one of the fire services radioed that they had found the airplane, about ten minutes after the accident. In line with what has already been recommended by ANSV with safety recommendation no. ANSV-13/1836-10/5/A/12, it is recommended to ENAC and the National Fire Department to adopt urgent initiatives deemed most appropriate under the educational profile and representative training to enable staff of firefighters working on Italian airports to have an actual full knowledge of both aviation terminology and of the airport grounds on which it operates, so as to avoid misunderstandings in communications related to disaster relief, to the benefit of timely detection aircraft requiring rescue. ANSV recommends ENAC and ENAV, in general, that the Tower, in directions to be supplied in the activation of the rescue operation, gives references correlated to the GRID-MAP of their airport.